So much yarn, so little time. : Meerkats worry too, you know. I love the concern on that meerkat's face! thanks for the laugh on this Tues morn!! ROFL - you're such a love!! How do we know if they're worring? Do they walk round the field biting their nails and pulling their fleece out? Heather, I just love your merkats!! You just crack me up! "Do they walk round the field biting their nails" So long as they don't bite taht rather fine looking metallic purple nail!! Dan - thank you for noticing! No meerkats (or manicures) were harmed in the making of this blog post. 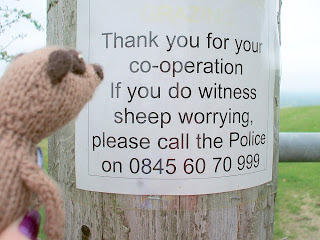 Of course someone, namely me, had to google sheep worrying to find out what it was. Ah I get it. Jane it hadn't occurred to me that my transatlantic readers wouldn't also use the term - hmm, lost in translation again! I wonder what your term is? Either way, I reckon meerkats could be both worrier and worried. is he worrying that he might worry them? hmmmm. funny, i have always got the impression they are soooo contemplative! great sign! Love the fingernail polish!! You are SO awesome Nifty!